Fine 0062076019 Ships from Tennessee, usually the same or next day. The Washington Posts mustread guide to healthcare reform traces how President Obama and the Democrats achieved this historic overhaul, explains the legislation itself, and shows how it will impact individual Americans.After a yearlong political war, in March 2010 President Obama and the Democratic leaders of Congress achieved a victory that has eluded lawmakers for seventyfive years: an overhaul of Americas healthcare system. In this indispensable book, the staff of the Washington Post tells the story of healthcare reform and explains what it means for the American people.In the books first section, the Washington Posts reporter embedded in the White House provides a behindthescenes narrative of how Obama and the Democrats pushed through healthcare reform in the face of nearly unanimous Republican opposition. This section traces the tortured evolution of the legislation, showing how the Senate killed the public option, how the January 2010 victory of Republican senator Scott Brown left the Democrats scrambling, and how Democratic leaders ultimately negotiated among entrenched political factionsincluding disillusioned Democratsto reach a compromise.What does this final package include? 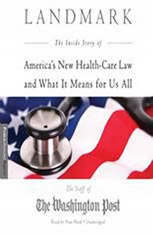 The books second section provides an accessible summary of the legislation that Obama signed into law in March 2010. In the third section, Washington Post writers answer the most pressing questions about the healthcare legislations immediate impact. Most importantly, how will the new bill affect individualssmallbusiness owners, uninsured Americans with preexisting conditions, and twentysomethings on their parents policies? This is a mustread for anyone who wants to understand how this legislation came into being and what the new healthcare program means. Good 1941627498 Item in good condition and has highlighting/writing on text. Used texts may not contain supplemental items such as CDs, info-trac etc. Fiscal realities and changing social priorities are requiring a dramatic shift in the way that benefits are selected and awarded to employees, especially in the public sector. This means that public administrators and policy researchers must consider new parameters and contingencies, both financial and social, when evaluating choices and making policy decisions. The Handbook of Employee Benefits and Administration provides HR managers, consultants, and students and scholars in public administration with a comprehensive overview of this critical employee component. Respected experts in government and academia delve into an exploration of all major benefits, including retirement and healthcare, with a specific emphasis on growing concerns and trends within the public sector. Satisfying the demand for authoritative research on HR Management, thisbook provides analysis and insight on the most pressing areas of concerns, including: Public employee benefits examines ethical principles and economic considerations; compares federal employee benefits to those of the private sector Health and retirement benefits explores the changing environment of state and local government pensions and retirement planning in the US and UK; compares public and private sector wage and health benefit compensation Financial management considers growing challenges and the trend towards outsourcing Contemporary benefits discusses emerging opportunities, such as higher education and domestic partner benefits Featuring keen analysis and concise summaries in each chapter,this exhaustive reference offers public policy administrators and researchers theinformation and insight needed to shape future discussions of benefit packages for public employees. This book provides a scholarly discussion of arguably the most important advance in U.S. public health services since Medicare 50 years ago -how the Federal program known as the Patient Care and Affordable Care Act of 2010 (ACA) or "Obamacare" became law. It addresses ACA in terms of its impact on improving health and behavioural health services for keydiverse populations in America, including people with disabilities, consumers, women, racial and ethnic minorities, and veterans and their families. From the very beginning, ACA was controversial and the topic of heated political debate at both state and national levels. This book examines more closely how the legislation was developed, including the political history of the act; the many advocacy efforts at the national level and the community-based action strategies at the grassroots level; how ACA will affect a broad cross-section of America; the integration of health and behavioural health services as a key component of ACA; the financing of ACA and parity for behavioural health services. This book was originally published as a special issue of the Journal of Social Work in Disability & Rehabilitation . Good 142217560X Item in good condition. Textbooks may not include supplemental items i.e. CDs, access codes etc. Deals with the topic of health inequalities and health disparities. This book examines racial and ethnic inequalities and disparities. It focuses on consumers and topics of health care disparities. It also focuses on issues related to substance abuse, mental health and related concerns. Hodgson and Carter present a volume that contributes to the ongoing debate in Knowledge Management. They develop themes explored in Roy Jacques' influential text, Manufacturing the Employee, as a starting point the authors consider the status of contemporary management knowledge. They do this from a range of theoretical positions that draw key implications for both research and teaching. The volume hosts an array of eminent scholars in the field. The collection explores, and at times takes issue with, the increasing influence of post-structuralist thought on our understanding of the nature of management knowledge, and draws key implications for both research and teaching. The various chapters consider the nature of management knowledge from perspectives as diverse as management history, discourse analysis, gender, post-structuralism, social construction, neo-institutionalism, and critical realism. The Impact of 9-11: The New Legal Landscape is the third volume of the six-volume series The Day that Changed Everything? edited by Matthew J. Morgan. The series brings together from a broad spectrum of disciplines the leading thinkers of our time to reflect on one of the most significant events of our time. With a foreword by the former Senate Intelligence Committee Chairman Senator Bob Graham, the volume's contributors include Alan Dershowitz, Aziz Huq, William Weaver, and other leading scholars. The Impact of 9/11 and the New Legal Landscape is thethird volume of the six-volume series The Day that Changed Everything? edited by Matthew J. Morgan. The series brings together from a broad spectrum of disciplines the leading thinkers of our time to reflect on one of the most significant events of our time.